2.2 NT : AMSANT and Congress Alice Springs attend successful first meeting in Alice Springs of the NT Tripartite Forum advising NT and Australian Gov’s on implementing all the reforms from the NT Royal Commission. 3.WA : AHCWA staff were formally acknowledged for their years of dedication and commitment to the Aboriginal Health Council of WA. 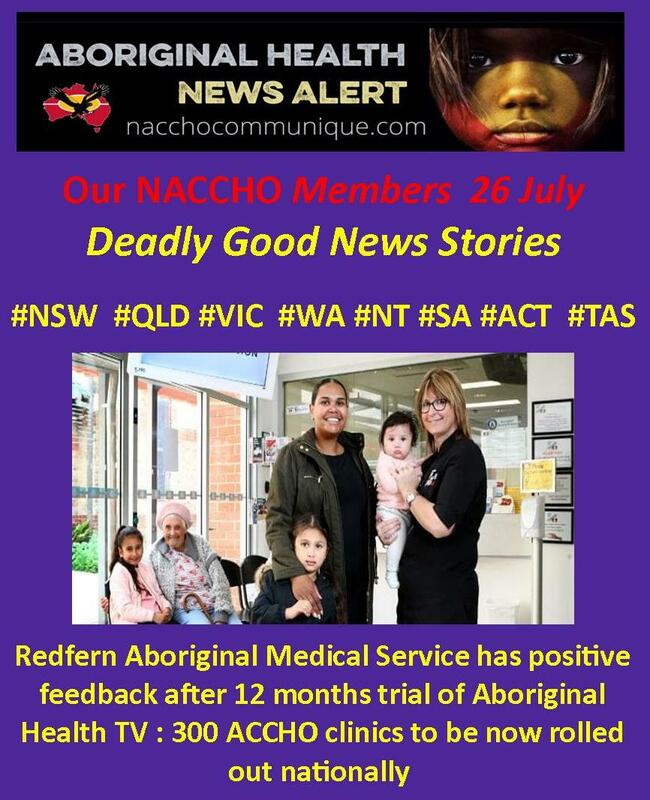 At Sydney’s inner-city Redfern Aboriginal Medical Service, where the system has been under trial for the past year, clinic co-ordinator Maree Tohi is convinced it drives change. Picture above from left, Lucia Moschella, 6, ‘Aunty’ Phemie Bostock, Siena Moschella, 4, Amelia Moschella, Carmela Moschella, six months, and Maree Tohi, the medical clinic co-ordinator at the Aboriginal Medical Service Co-operative in Redfern, Sydney. Picture: Hollie Adams. 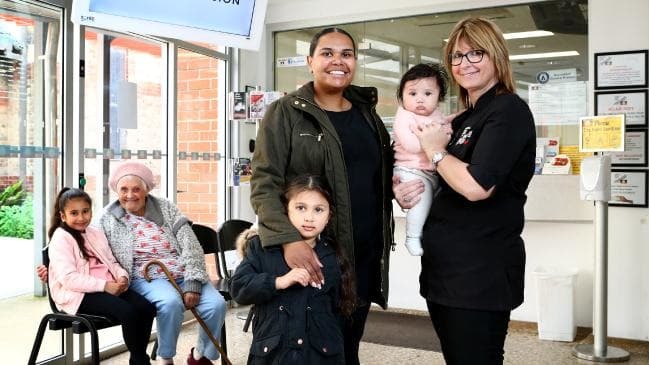 Indigenous health is about to get a digital shot in the arm, with the ­nationwide rollout of a TV network to capitalise on the time ­people spend in waiting rooms before seeing a medical practitioner. Segments will be presented in indigenous languages where appropriate and much of the content will be locally produced, then professionally edited and redistributed via online connections. 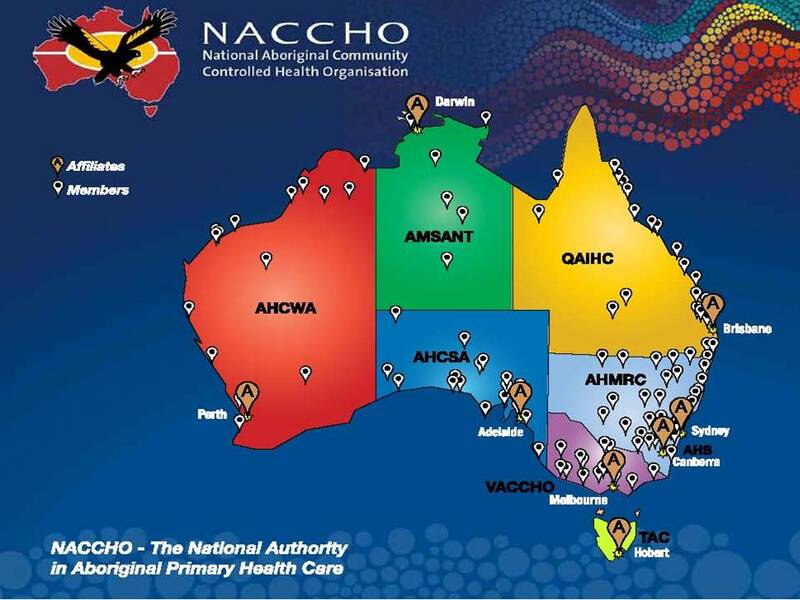 The aim is to address the national disparity in indigenous health, particularly with chronic conditions. 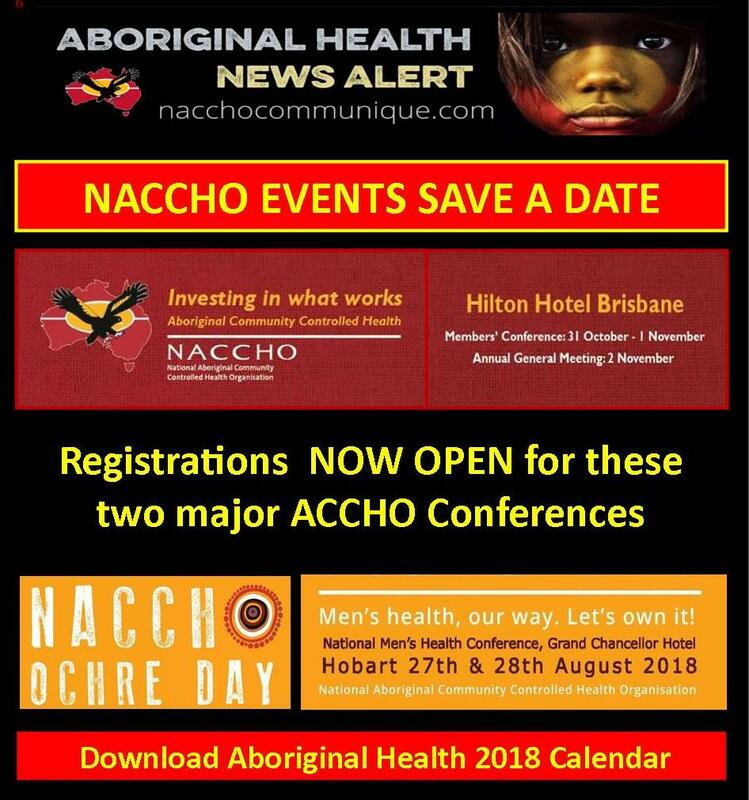 It is believed to be a world first in indigenous health, delivering messages on subjects as varied as smoking, eye and ear checks, skin conditions, diet, immunisation, sexual health, diabetes and drug and alcohol treatment services. 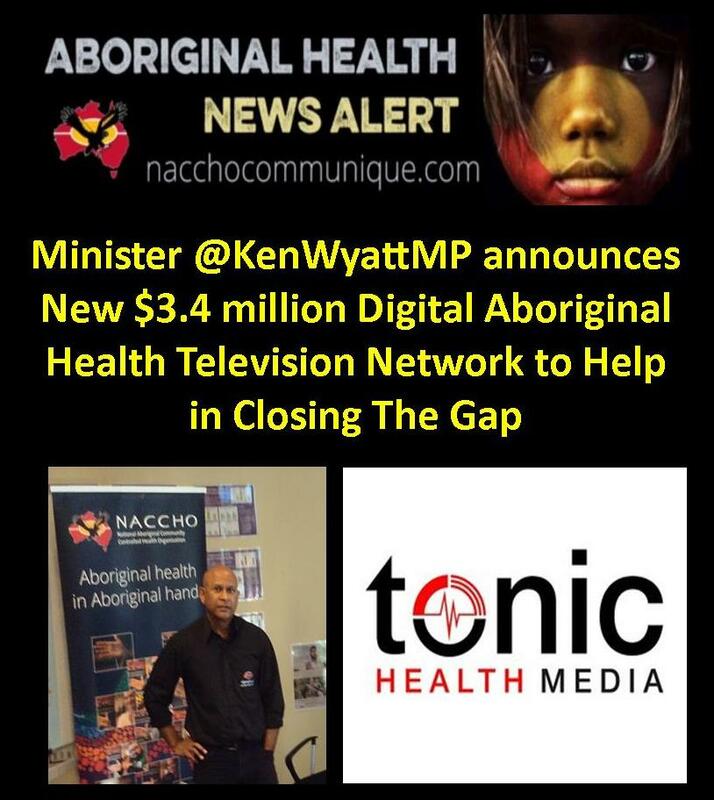 With a $3.4 million, three-year commitment to be announced by Indigenous Health Minister Ken Wyatt, the network is being ­developed by Tonic Health Media, the communications powerhouse built by ABC medical broadcaster Norman Swan and psychiatrist and health services entrepreneur Matthew Cullen. Research has shown that targeted audio-visual messaging in medical waiting rooms tends to encourage patients to bring up specific issues with practitioners and modify behaviour. “There’s lots of data that people watch the screens, then discuss the issues they’ve seen with their ­GP and with their families,” Dr Cullen said. 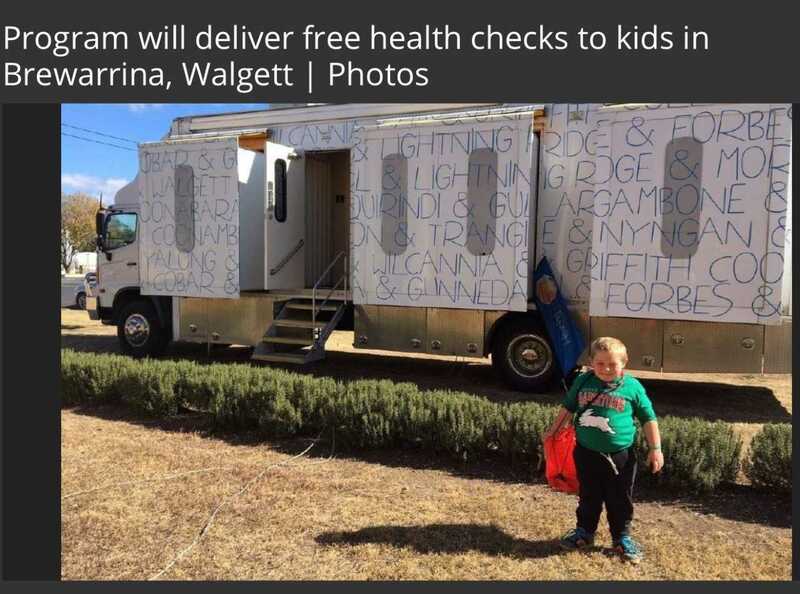 Royal Far West, in partnership with the Walgett Aboriginal Medical Service (WAMS), Brewarrina Aboriginal Health Service Limited (BAHSL) and Ronald McDonald House Charities, will deliver the free child health checks in Brewarrina (August 13) and Walgett (August 14-15). The health checks will be alongside the WAMS Healthy for Life checks. In May this year Royal Far West’s major fundraiser Ride for Country Kids visited Walgett and Brewarrina, and the charity is looking forward to once again bringing the Healthy Kids Bus Stop to these communities. It will be the first time the Bus Stop will be in Brewarrina since 2014, and will be hosted by the Gainmara-Birrilee Preschool. Walgett Community College Primary School is hosting the Bus Stop’s fourth visit to Walgett. Other key partners include local pre-schools, schools, councils and community service organisations. The program is designed as a collaborative exercise to benefit young children within the community at no cost to their parents/carers. 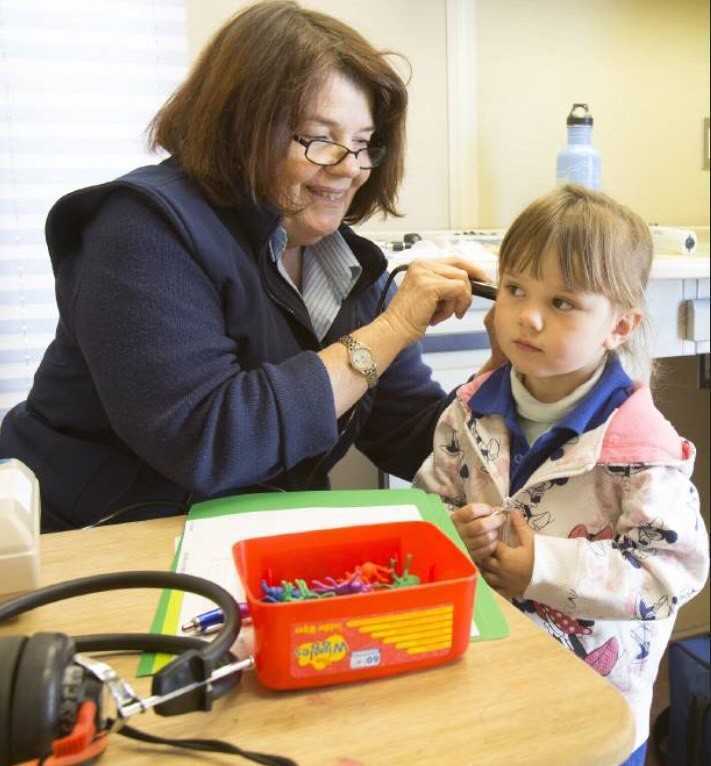 Assessments include a child health check; hearing screening; dental check; fine and gross motor skill development screening; language and speech development check; and a food nutrition check, all at the one location in either a morning or afternoon appointment. Children requiring further assessment will be referred to appropriate local services, and those with complex needs may also be referred to Royal Far West’s Paediatric Developmental Program. Katrina Ward, Manager, BAHSL, is pleased to be able to support this important screening activity. 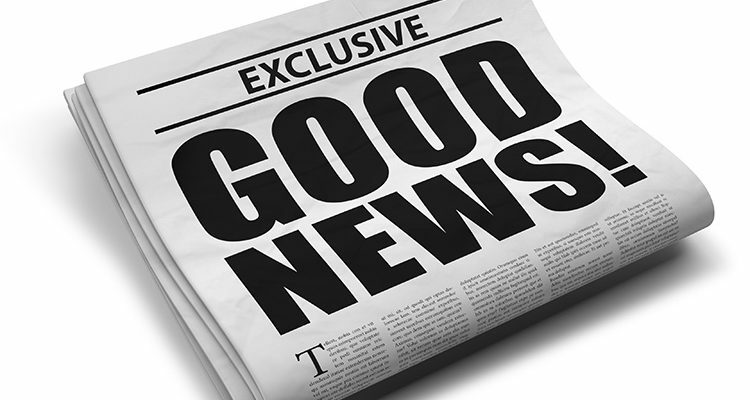 Brewarrina Mayor Phillip O’Connor said he was thrilled that Royal Far West is once again bringing this important and innovative program to the town. 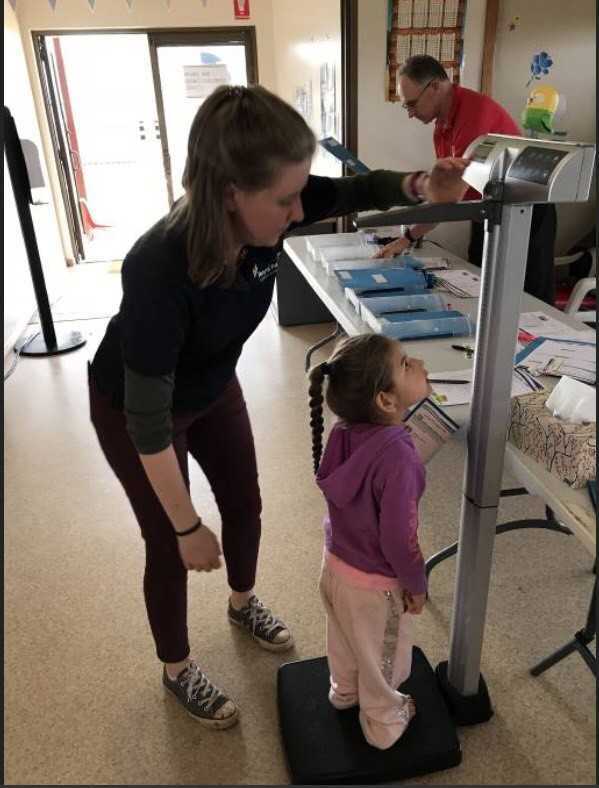 “As well as being a fun and interactive experience, these health assessments help to identify and support our local children with health and developmental needs that might otherwise go unnoticed,” he said. Register for the Bus Stop at www.royalfarwest.org.au/programs, or call Jennifer Goonan on 02 8966 8557 for more information. 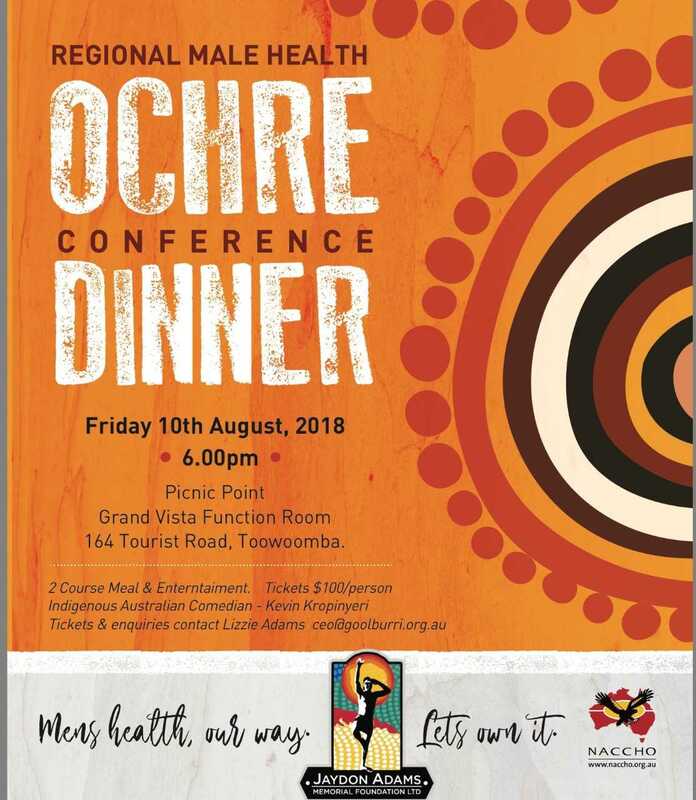 Throughout May and June 2018 Danila Dilba, on behalf of the Aboriginal Medical Services Alliance of the NT (AMSANT) met with people throughout the Northern Territory to talk about the Royal Commission into the Protection and Detention of Children in the NT. 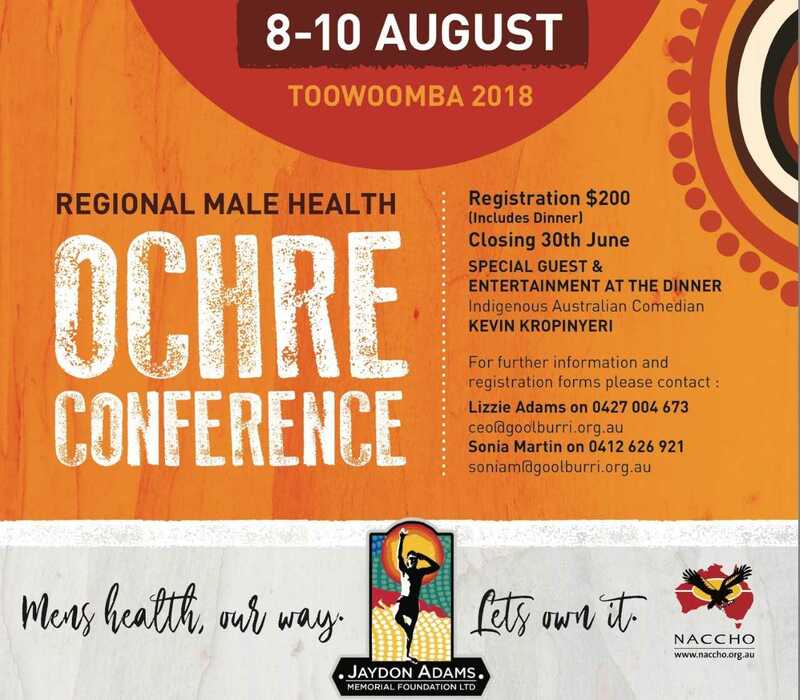 Workshops and community meetings were held in the NT’s major population centres (Katherine, Tennant Creek, Alice Springs, Darwin), and in three remote communities in East Arnhem (Nhulunbuy, Milingimbi and Galiwin’ku). The workshops provided information to community members and service providers about the outcomes of the Royal Commission and a broad outline of proposals for legislative reform, and gathered information about community members’ experience of the child protection system and views on the proposed reforms. Serious concerns about the current system and its failure to deliver good outcomes for families and children were raised. 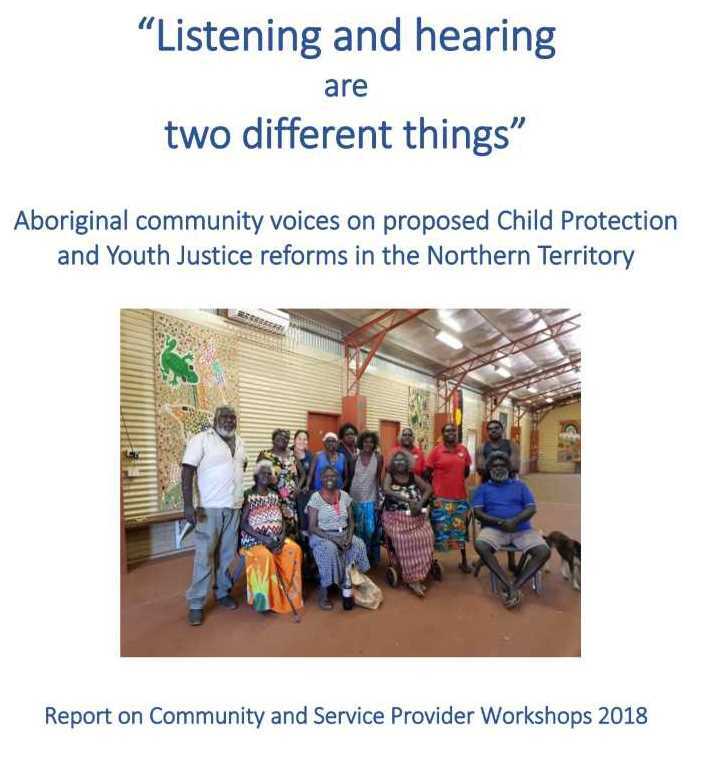 AMSANT compiled a report – ‘Listening and Hearing are Two Different Things’ detailing the feedback from these workshops and making recommendations for reforms. 2.2 NT : AMSANT and Congress Alice Springs attend successful first meeting in Alice Springs today of the NT Tripartite Forum advising NT and Australian Gov’s on implementing all the reforms from the NT Royal Commission. Federal Minister David Gillespie and Territory Minister Dale Wakefield welcomed the congregation of the first Tripartite Forum to discuss both Governments’ response to the Royal Commission into the Protection and Detention of Children in the Northern Territory. The Tripartite Forum is a newly-established advisory body that highlights the importance of working together to support implementation of the reforms resulting from the Royal Commission. The first meeting was an opportunity to establish strong foundations for the future work of the Tripartite Forum, which will oversee the development of a 10-Year Generational Strategy, build on the Territory’s Early Childhood Plan and ensure strong Aboriginal engagement. Participating in the Tripartite Forum were representatives from the Aboriginal-controlled sector, other nongovernment organisations, the Commonwealth government and the Territory government. Each brings with them relevant experience, skills, qualifications and other credentials to contribute to the Forum’s work. Ms Wakefield said collaboration is the key to successfully implementing reform of the youth justice and child protection systems. 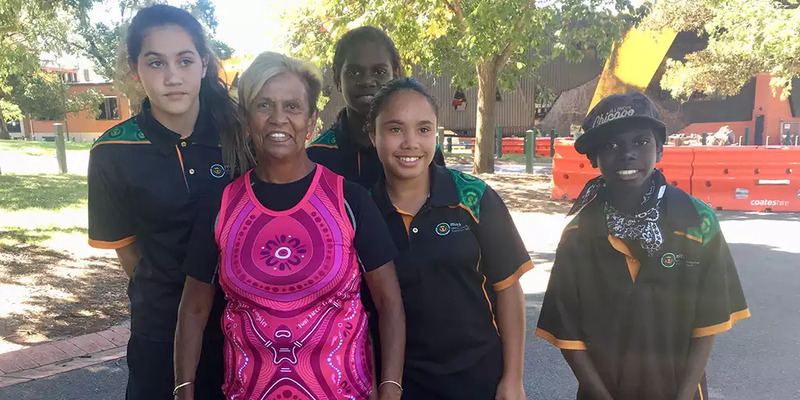 “The Northern Territory Government is investing significantly in reforms to create generational change and make a brighter future for all Territorians,” she said. “However we can only succeed if we are all pulling in the same direction. This forum will give us the guidance and direction to achieve real change”. Earlier this month, Ms Donna Ah Chee was announced as the Chairperson of the Tripartite Forum. She is a highly respected Aboriginal woman with 30 years’ experience in the Northern Territory as a CEO, Chairperson and Board member. 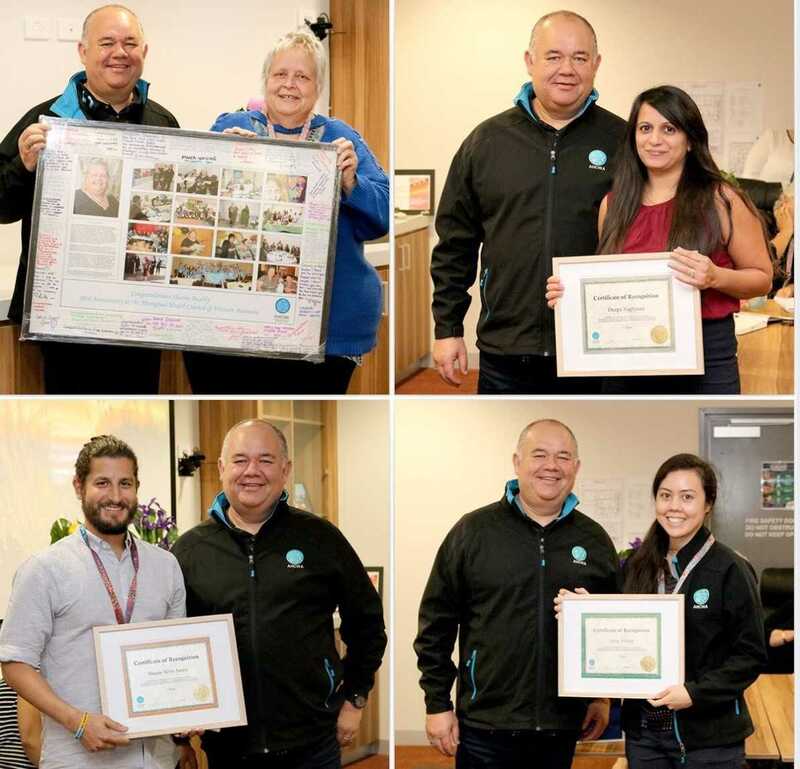 The Certificates of Recognition were presented to the following staff members for their loyalty and hard work that contributes to the ongoing success of AHCWA and the support provided to our Aboriginal Community Controlled Health Services. And a special congratulations to Sharon Bushby on her 10th Anniversary of Service to AHCWA. 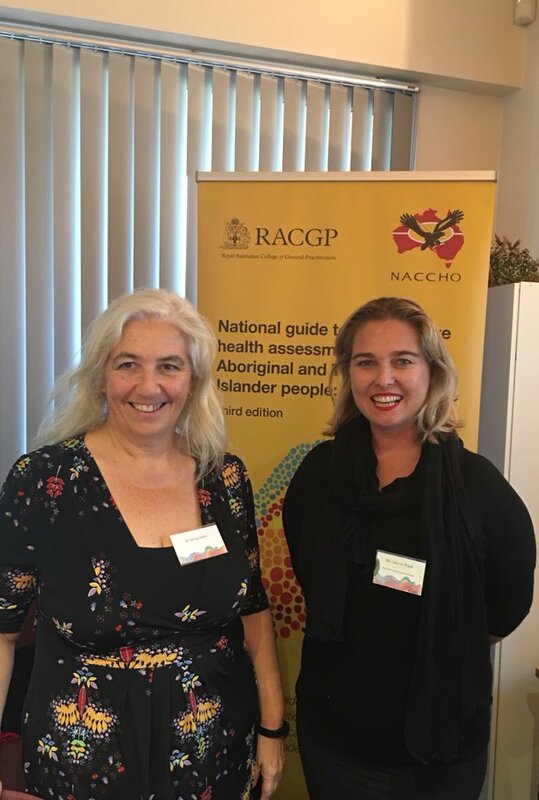 As an Aboriginal elder, who cares very deeply about the health of her people, Aunty Pam Pedersen from the Yorta Yorta people, literally jumped at the opportunity to be one of Richmond’s participants in our partnership with VicHealth and its This Girl Can Victoria campaign. But it hasn’t always been this way for Aunty Pam, daughter of famous Aboriginal activist and Fitzroy player, Sir Douglas Nicholls, whom the AFL’s Indigenous Round is named after. Twenty-five years ago she felt unfit and overweight and despite thinking she wasn’t good at sport and people might point and laugh, something had to change. “When I was turning 50, I looked at myself and thought, ‘Oh my goodness, I really need to do something about myself, because I wasn’t active at all. Despite her incredible optimism and sunny outlook, Aunty Pam, who this year was given a clean bill of health after battling breast cancer, still faces her own fears of judgement around how she looks. “My main goal is to be healthy and unfortunately I’m putting on a bit of weight and that bothers me. Throughout her fitness journey, Aunty Pam has tried numerous sports from walking to running, swimming and triathlons. Each sport presents it challenges, but she’s determined to continue to be a role model for her people. “Get out there and show non-Aboriginal people that us Aboriginal people are just as capable,” she says. VicHealth research reveals that worrying about being judged stops many women from being physically active. In fact, 41% of Victorian women feel too embarrassed to exercise in public. Which is why campaigns like This Girl Can Victoria are so important. Empowering women to be active whenever, wherever and however they choose, in a supportive environment. Some great conversations happening here! Videoconferencing “selfie” included, we are working with the Burnie and Launceston sites as well.